Two dozen alleged gang members have been indicted on federal racketeering and other charges after an investigation determined they oversaw a violent drug operation in Baltimore City and County that was associated with murder, extortion, witness intimidation, money laundering and other crimes, prosecutors said Tuesday. 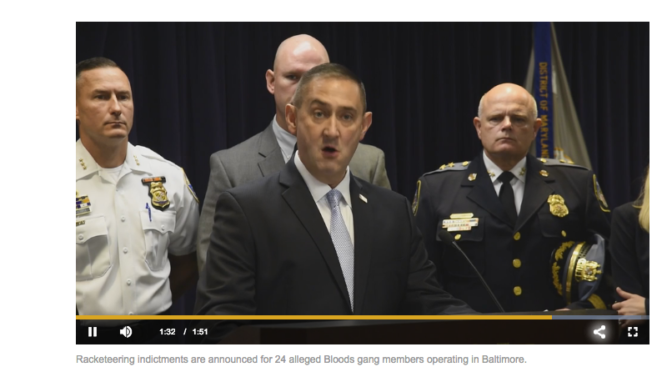 Maryland U.S. Attorney Rod J. Rosenstein said other gangs in the Baltimore area should consider the indictment of the “Murdaland Mafia Piru” members — the result of an extensive investigation involving wiretaps and reviews of social media postings — as a warning from local and federal law enforcement. The Murdaland gang, associated with the California-based Bloods organization, first gained a foothold in Northwest Baltimore and surrounding communities in Baltimore County — as well as in correctional facilities in the state — in 2008 after another federal indictment helped to dismantle the then-dominant local Bloods gang, the Tree Top Piru, prosecutors said.